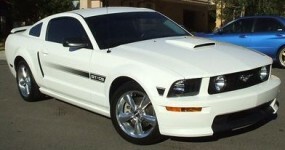 The 2007 Mustang GT-CS California Special is a GT Premium options package which includes unique California Special contracting Dove or Parchment "GT Leather" inserts on leather sport bucket seats, CS badged floor mats, unique front fascia, larger air intake, a chin spoiler that is 1.5 inches lower than the standard GT, unique rear fascia with a race car like "diffuser", side scoops, bright rolled exhaust tips, and GT-CS tape stripe. Vista Blue 2007 Mustang GT/CS coupe owned by Josh from Hurricane, West Virginia. This was our featured Attitude Of The Week photo for the week starting November 11, 2008. Josh tells us more, "I purchased this car new at the dealer in September 2008. This is the fifth mustang I have owned and one of my favorites so far. Current modifications include: Steeda CAI with Brenspeed 93octane SCT tune, Pypes X-pipe w/cats, Steeda Mufflers, FRPP springs, Roush Hood Scoop, and Roush Wing. Future modifications will include either the Roush or Whipple supercharger and possibly cams and forged internals." Grabber Orange 2007 Mustang GT California Special coupe owned by Chris Borden. This is our featured Attitude Of The Week for the week starting March 22, 2015. Chris tells us, "This is my first Mustang. I bought this two days ago at a BMW dealership. It was a one-owner trade-in and is in immaculate condition with very low mileage. I can hardly contain my excitement at having found it because I have salivated over Grabber Orange since it was first introduced when I was in High School."